Because of its unparalleled versatility, globally, the SUV has evolved into the “aspirational” vehicle of most people who dream of owning a car. “Goodyear, recognizes the versatility of the SUV, as well as the fact that SUV owners are a diverse group, with complex requirements,” shared Goodyear Philippines Market Director Kenneth Sambajon at the launch of Goodyear’s latest range of SUV tires. Goodyear launched not one, but four models of SUV tires for versatile SUVs and the diverse people who love them. In the past, the predecessors of what we now call SUVs were rugged, purpose built machines designed for terrain and conditions that would simply break less robustly designed vehicles. They were also notoriously exasperating to drive on-road. They had very heavy steering that required frequent correction just to stay in a straight line, they were hilariously slow, and had the passing power of a road roller, they were also uncomfortable to ride under any set of conditions. They were vehicles for a select, specialized group of people with distinct needs. The modern SUV will out accelerate and out corner most compact sedans, and even most sports cars from the 90s. Mid-sized SUVs are often as comfortable and even more spacious than mid-sized sedans. As refined and car-like as the modern SUV is, manufacturers haven’t “tossed” the parameters around which today’s these are designed. They still have extra tough chassis and suspensions, high ground clearance and most of all, large, rugged, and formidable tires. “While SUV characteristics such as high ground clearance and ample cabin and storage space appeal to almost all SUV owners, most SUVs will never be used for off-roading. The popularity of 4x2 SUVs is proof of that. 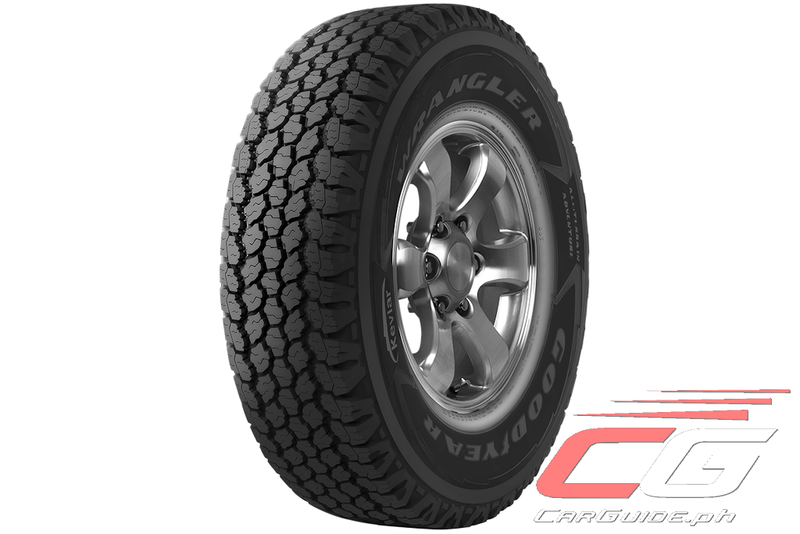 So, for on-road conditions, most SUV owners will need a set of grippy, quiet, and comfortable tires. 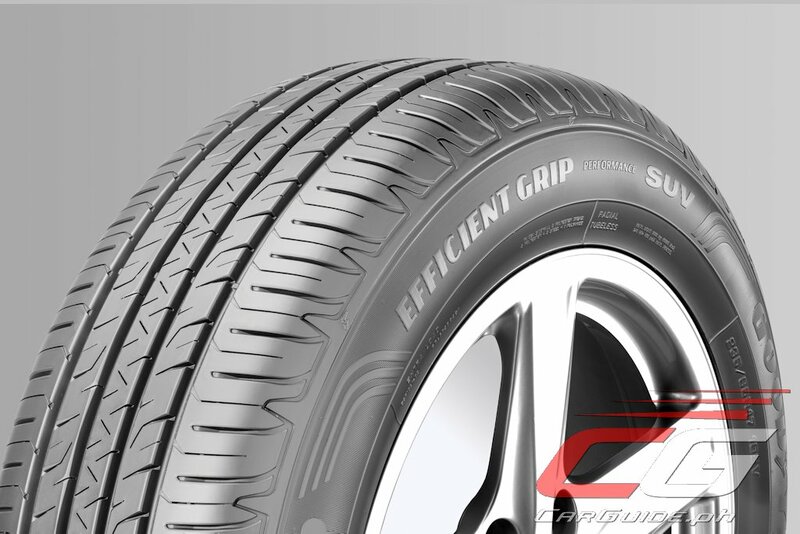 That is precisely what the new Goodyear Efficient Grip Performance SUV provides,” shares Sambajon. Designed primarily for premium SUVs, Goodyear EfficientGrip Performance SUV utilizes an array of technologies to deliver premium on-road performance. QuietTread technology consists a noise-dampening advanced tread and carcass design which provides improved noise performances as the tire wears that helps deliver a quieter and more comfortable ride. The FlexContact Technology has a shock absorbing cushion layer compound which lowers tire vibration in order to reduce the impact of road irregularities, providing for a smoother and more comfortable drive. The EfficientGrip Performance SUV promises excellent Wet Performance with its new innovative polymers with optimized microstructure for increased grip in wet road conditions, along with wider and reinforced shoulder blocks to increase braking performance. For “weekend warriors” there is the Wrangler All-Terrain Adventure with Kevlar with 50 percent off-road and 50 percent on-road application. Reinforced with Dupont Kevlar typically reserved for bulletproof vests, this tire is for city dwellers who might decide at a moment’s notice to head out to far flung rural areas. It is a do all tire that is also equally at home on the open highway. For the more rugged adventurers that require versatility for long stretches of highway, challenging terrain and tough off-road trails, there is the Wrangler Duratrac with 70 percent off-road and 30 percent on-road application. 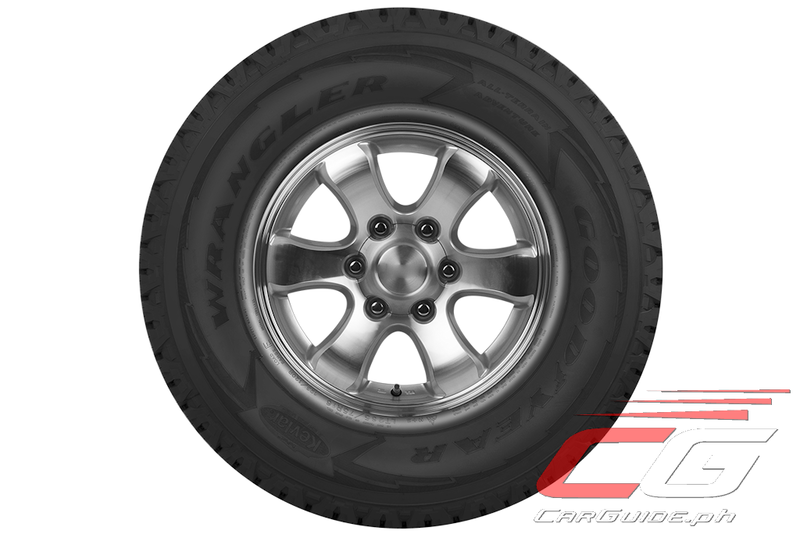 With its TractiveGroove technology that offers enhanced traction in deep mud, unique tread block design and rim protector, the Wrangler Duratrac is the perfect workhorse tire for rugged off-road terrain that still offers a quieter ride on paved roads. The Wrangler MT/R with Kevlar is for serious off-roaders only. The kind who go out of their way to push their skills and their SUVs to the absolute limit. 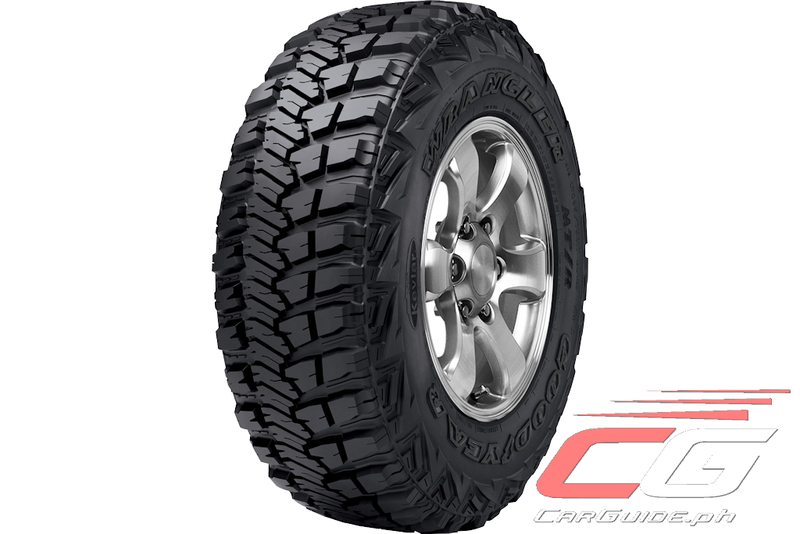 Built for the most extreme and most challenging road conditions, this is Goodyear’s first off-road tire to incorporate DuPont Kevlar on its 3-ply sidewall brining superb cut and puncture resistance to an area of the tire that demands extra toughness when driving off-road. 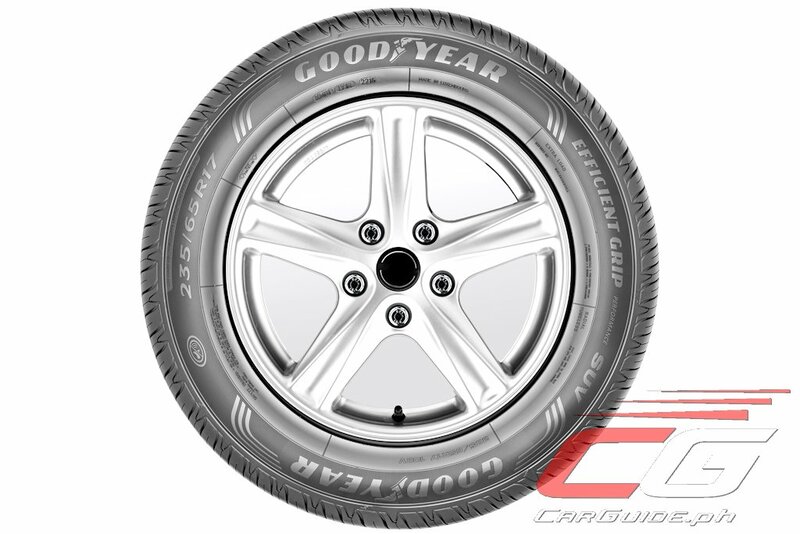 “Whether you are a doting parent who likes to take your family on the occasional outing, or an adrenaline junkie who loves the freedom and the adventure of pushing a beast of an SUV to its very limit, Goodyear makes a tire perfect for your SUV and your unique lifestyle,” concludes Sambajon. 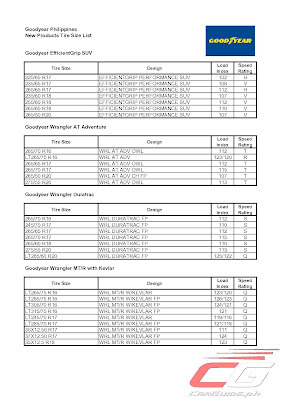 Goodyear EfficientGrip Performance SUV, Wrangler All-Terrain Adventure, Wrangler Duratrac, and Wrangler MT/R with Kevlar and are available at Goodyear Autocare outlets. All four tire models are available with the Goodyear 5-Year Limited Warranty and Goodyear Worry Free Assurance.